Annual Report 2017 25 years of delivering value. On June 3, 1993, Kinross Gold Corporation appeared as a new listing on the Toronto Stock Exchange. In its first year of operation, the new company would account for gold equivalent production of just over 80,000 ounces. Kinross has come a long way since those humble beginnings. 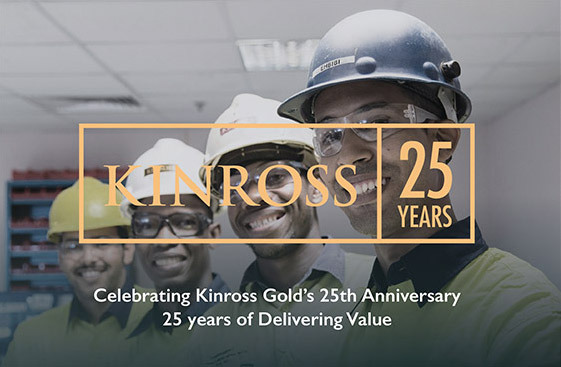 As we celebrate our 25th anniversary in 2018, it’s worth reflecting on the strengths that have made Kinross one of the world’s leading gold producers, and that continue to drive the exciting future we are building. The Company’s impressive performance in 2017 underscored those strengths in multiple areas. 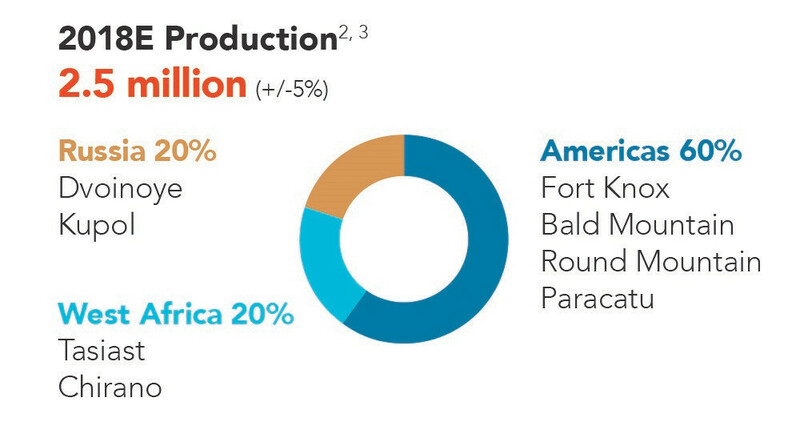 Our production of 2.67 million gold equivalent ounces2 ranked among the world’s top producers. We met our guidance for production, costs and capital expenditures for the sixth consecutive year. We finished 2017 at the high end of our production guidance and the low end on both cost of sales and all-in sustaining cost, demonstrating how the strategic priority of operational excellence has become embedded into day-to-day practice at our sites. Our teams at Bald Mountain, Round Mountain and Tasiast all deserve special mention for an outstanding year. Kinross’ financial strength – another strategic priority – was further reinforced in 2017. Our operations generated adjusted cash flow of over $1.2 billion, while our adjusted net earnings almost doubled year-over-year. Our strong liquidity of $2.6 billion gives us a solid financial foundation for advancing our impressive portfolio of low-risk, high-quality organic development projects. 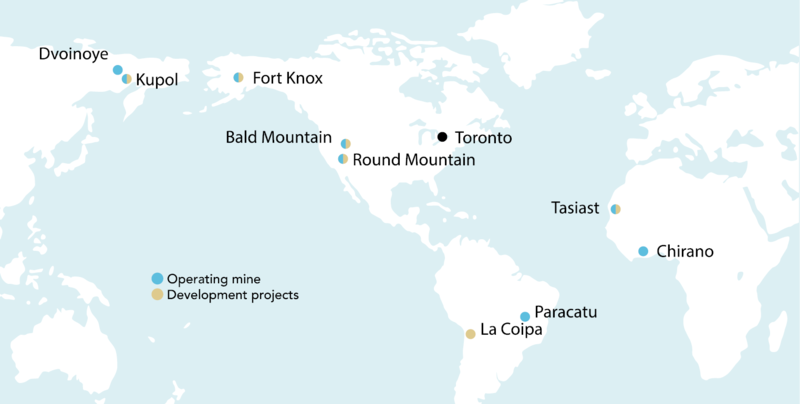 These projects have benefited significantly from another key Kinross strength: the skill of our technical teams in de-risking projects, optimizing mine plans, and finding innovative solutions to improve overall economics and returns by reducing capital and operating costs. In 2017, we made excellent progress at these projects and met all our key milestones, on schedule and on budget. At Tasiast, construction of the Phase One expansion advanced on schedule, and we are on track for full commercial production by the end of June 2018. We also announced that we are moving ahead with Phase Two of the expansion, which promises to deliver the full potential of the world-class Tasiast deposit. 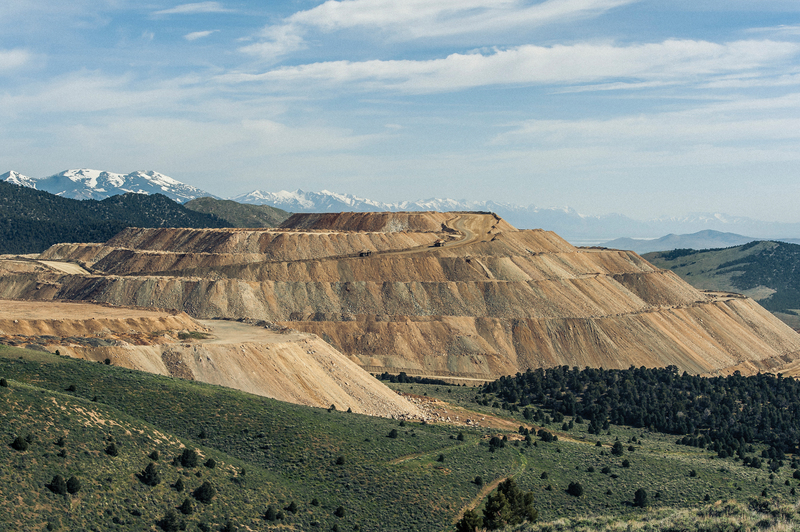 In Nevada, we are moving forward with the Round Mountain Phase W project, while the Vantage Complex at Bald Mountain is proceeding on schedule. In Russia, we look forward to initial high-grade ore from the Moroshka deposit in the second half of 2018. We also announced additional development opportunities. Most notably, at Fort Knox in Alaska, the Gilmore project gives us mineral rights to a significant land parcel immediately adjacent to the mine, more than doubling measured and indicated mineral resource estimates and providing an exciting opportunity to extend the life of one of our best mines. In 2018, we look forward to delivering on additional milestones at all of our projects and opportunities as we continue to execute our development plan. We remain prudent and disciplined in our approach to mergers, acquisitions and divestitures to generate value for shareholders. In 2017, we unlocked significant value for our shareholders and enhanced our balance sheet through the sale of Kinross’ 25% interest in Cerro Casale for consideration including $260 million in cash, a $40 million deferred payment, and a 1.25% royalty. At the same time, we are making other prudent investments to lower costs and secure the future of our existing mines. At Paracatu in Brazil – a large, long-life cornerstone asset – we recently announced the acquisition of two hydroelectric power plants. These plants are expected to lower overall cost of sales by approximately $80 per ounce over the life of mine while securing approximately 70% of the mine’s long-term power requirements. Achieved year-over-year improvements in safety metrics of injury frequency and severity. Regrettably, our strong safety record was overshadowed by an employee fatality at our Kupol mine, underscoring the importance of keeping safety top of mind every shift, every task. Met production and cost guidance for the sixth consecutive year. Produced 2.67 million gold equivalent ounces (Au eq. oz. ), at the high end of our guidance range, at a cost of sales of $669 per Au eq. oz., and an all-in sustaining cost of $954 per Au eq. oz., at the low end of our guidance range. Generated $1.2 billion in adjusted operating cash flow, a $240 million increase year-over-year. Ended 2017 with more than $1 billion in cash and total liquidity of approximately $2.6 billion. Advanced Phase One construction of the Tasiast mill expansion, which remains on schedule for full commercial production by the end of June 2018. Announced decision to proceed with Phase Two of the Tasiast expansion and commenced engineering and procurement. Announced decision to proceed with Round Mountain Phase W and commenced stripping, initial construction and site preparation activities ahead of schedule. Advanced the Vantage Complex project at Bald Mountain on schedule. Completed the September Northeast project in Russia and commenced development of the Moroshka deposit. Gained mineral rights to the Gilmore land package, adding 2.1 million ounces in estimated measured and indicated mineral resources and potentially extending mine life at Fort Knox. Launched a pre-feasibility study at Tasiast Sud. Added approximately four million ounces to mineral reserve estimates to offset depletion. Extended mining at Round Mountain by five years, Fort Knox mine life by one year, mill production at Kupol by one year and Paracatu mine life to 2032. Spent more than $2 billion in countries where we operate through local purchasing, wages and taxes to benefit local communities and provide economic value. We forecast another year of solid operating results in 2018. Gold production is forecast to be 2.5 million Au eq. oz., which is in line with our average production over the last several years. Looking forward, we expect production to be at or slightly above 2.5 million Au eq. oz. over the next three years. Production cost of sales in 2018 are forecast to be $730 per Au eq. oz., while all-in sustaining costs are expected to be approximately $975 per Au eq. oz., in line with the mid point of our 2017 guidance. We expect production cost of sales to decline slightly in 2019 and 2020 as lower cost production comes online. Our capital expenditures are forecast to be approximately $1.1 billion, reflecting the investments we are making in our development projects as we leverage our financial strength to build our future. In 2017, our operations generated approximately $1.2 billion in adjusted operating cash flow, an increase of approximately 25% over the previous year. Year-over-year, our cash position increased by approximately $200 million, and we entered 2018 with total available liquidity of $2.6 billion. Kinross has no scheduled debt repayments until 2021. Our excellent liquidity and strong balance sheet means we are well positioned to fund our pipeline of development projects. Kinross’ development strategy is focused on high-quality projects in our three operating regions, offering the key benefits of low execution risk, established infrastructure, and familiar permitting and operating jurisdictions. In 2018, we expect to meet important milestones at our five projects as well as our three additional development opportunities. Construction of Tasiast Phase One has proceeded on time and on budget. Full commercial production is expected by the end of June 2018. Phase One is expected to almost double Tasiast’s production to approximately 400,000 Au eq. oz., and significantly reduce all-in sustaining costs. Phase Two is expected to double Tasiast’s production once again to more than 800,000 Au eq. oz. per year, while further reducing costs. The project is proceeding on schedule, with project and construction teams expected to transition from Phase One to Phase Two development to establish project continuity. Phase Two is scheduled to begin commercial production in Q3 2020. Strong work by our technical team contributed to a significant improvement in forecast returns for this project, which is expected to add an additional five years of mining at one of Kinross’ top performing operations. Stripping, initial construction and site preparation commenced ahead of schedule in late 2017. The project remains on schedule to encounter initial low-grade ore in mid-2019. Kinross continues to view Bald Mountain as a long-life asset with considerable upside potential, given its large under-explored land package and pipeline of high-quality targets. The Vantage Complex project is proceeding on schedule, with construction well underway. Commissioning for the proposed heap leach pad and processing facilities is expected to commence in Q1 2019. At the Moroshka satellite deposit in Russia, located approximately four kilometres east of Kupol, development of the twin declines is on schedule and on budget. Mining of high-grade ore at Moroshka is expected to commence in the second half of 2018 for processing in the Kupol mill. In late 2017, we were excited to announce that we gained mineral rights to the Gilmore land package, which lies immediately adjacent to Fort Knox and has the potential to extend mine life at one of our best operations. As a result of previous drilling at Gilmore, we have added 2.1 million ounces in estimated measured and indicated mineral resources at Fort Knox. A feasibility study to assess a multi-phase layback of the Fort Knox pit, and the construction of a new heap leach pad, is expected to be completed in mid-2018. A pre-feasibility study (PFS) for this Tasiast satellite deposit is proceeding as planned and is expected to be completed in the second half of 2018. The PFS contemplates a dump leach operation that would combine materials from multiple deposits in the area, and the trucking of high-grade ore to the Tasiast mill, located approximately 10 kilometres north of the project. In February 2018, Kinross entered into an agreement to acquire 50% of the Phase 7 deposit from its joint venture partner, which will give the Company 100% ownership of the Phase 7 deposit and the mining rights contemplated by the pre-feasibility study completed in 2015. The Company expects to receive the remaining sectoral permits required for the project in the first half of 2018. We have a particularly strong track record of adding ounces and extending mine life at our Russian mines and have now extended expected mill production at Kupol – a high-grade, high-margin asset – until the end of 2022. Kupol will again be an exploration priority in 2018. Other 2018 priorities include Bald Mountain, where we will conduct infill drilling and focus on earlier stage targets, and Tasiast Sud. While brownfields exploration remains Kinross’ core exploration focus, we also pursue greenfields opportunities and high-margin types of deposits through strategic investments and partnerships with high-quality junior exploration companies. We take pride in our 25-year history of co-operative relations with our host countries and local communities. That history has depended in part on strong company-wide standards and policies to back up our firm commitment to responsible mining. But it is also the result of diligent work by our local teams to maintain respectful, mutually beneficial relationships at a grassroots level – helping to ensure that Kinross is consistently regarded as a good neighbour wherever we operate. For example, at our Mineral Hill reclamation site, we were proud to partner with Trout Unlimited and the Rocky Mountain Elk Foundation to achieve positive benefits for the environment and local community by protecting important fish and wildlife habitat near Yellowstone National Park. We also actively listen and engage with our stakeholders. In 2017, we had more than 112,000 stakeholder interactions, including community members, government representatives, and non-profit organizations at our sites. Another key is helping our host communities build sustainable economic strength and capacity. In 2017, we spent more than $2 billion in the countries where we operate through wages, local purchasing, and taxes, in addition to our many direct and in-kind contributions in support of health, education, social, cultural, and environmental programs. In 2017, for the eighth consecutive year, Kinross Gold was named one of Canada’s Best 50 Corporate Citizens by Corporate Knights magazine, placing first among gold mining companies for the third year in a row. One of the best safety records in the industry. In closing, let me thank our employees – past and present – who have helped Kinross to grow and thrive for these 25 years. As our story enters its next exciting chapter, I also thank our shareholders for your continued support. 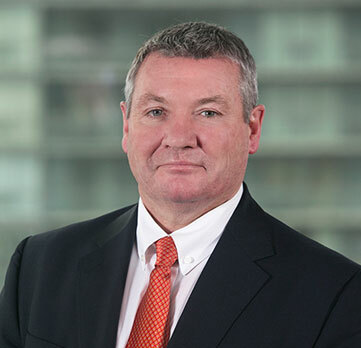 Kinross achieved sixth straight year of strong results and meeting production and cost guidance. We remained focused on operational excellence, building a culture of continuous improvement, innovation and disciplined cost management. $669 per Au eq. oz. We maintained significant liquidity and a strong balance sheet throughout 2017. With strong cash flow and zero debt maturities until 2021, we have the financial strength and flexibility to fund our pipeline of development growth projects. Our pipeline of five high-quality development projects are all proceeding on schedule and on budget, and extending mine life and adding ounces in all three Kinross regions – the Americas, Russia and West Africa. Three development opportunities and their exploration results are also expected to contribute to additional mine life and add reserves. Mining responsibly is integral to our business strategy. This requires operating in accordance with the highest standards of ethical conduct, and responsibly managing our impacts while leveraging opportunities from our activities to generate sustainable long-term value in host communities. Safety is our first priority. In 2017, year-over-year improvements in reportable injury rates were overshadowed by a single employee fatality, the first at a Kinross operation since 2012. A significant milestone: Kinross Gold has been operating for a quarter of a century. 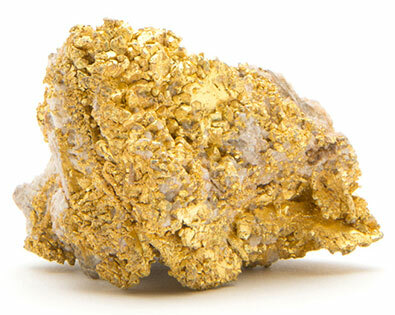 Twenty-five years of responsible mining and almost 40 million ounces of gold produced.